Q. What are the Principles of Q- CPR? Q- CPR (Quality) CPR is a useful descriptive term for the range of techniques to achieve maximal cerebral blood flow and coronary perfusion during the state of cardiac arrest. Q-CPR aims to maximise the chance of achieving return of spontaneous circulation (ROSC) and ultimately the survival of patients with good neurological outcomes (our ultimate objective). Achieving Q-CPR relies on absolute attention to detail of all aspects of resuscitation but especially of closed chest compressions (CCCs) including rate, depth and ensuring chest recoil is complete, as well as careful choreography of secondary therapies during the process of resuscitation. Minimise interruptions to CPR at all times. ILCOR have recently focussed attention on the priority of closed chest compressions as the single most important intervention in OHCA and have de-emphasised airway and ventilation in the early phase of resuscitation. Evidence demonstrates that bystander CPR rates correlate very well with survival in EMS systems and in both animal models and human patients the CPR fraction (the percentage of time that compressions are being delivered during the resuscitation) is highly correlated with successful resuscitation. Each time CPR is suspended for a task the coronary perfusion pressure falls rapidly and requires periods of several seconds to several minutes to re-establish. Just as important as CPR fraction is the quality of CPR being performed. “Hard and Fast. Correct Rate. Correct Depth. Full Recoil of the Chest” must be the mantra for the Team Leader at a cardiac arrest. 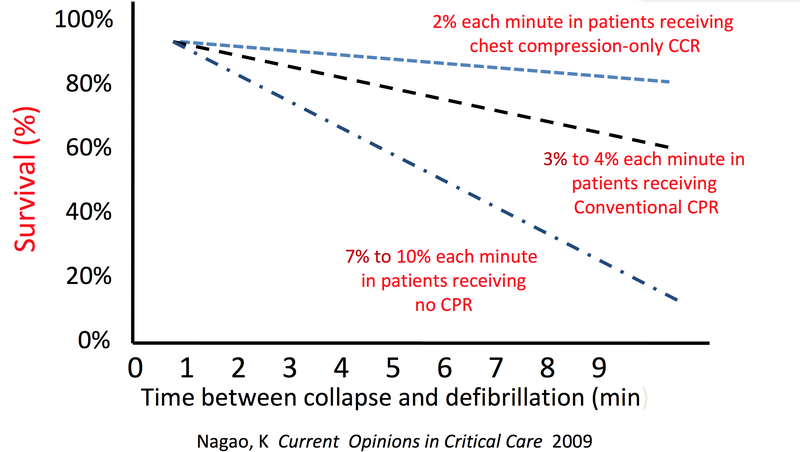 As chest compression rates fall, a significant drop-off in ROSC occurs. Rates higher than 100 may reduce coronary blood flow and impair the quality of each compression. Current guidelines recommend a single minimum depth for compressions of “at least ” 50 mm (2 inches) in adults. Less information is available for children, but it is reasonable to aim for a compression depth of at least one third of the anterior-posterior dimension of the chest in infants and children. The preponderance of literature suggests that rescuers often do not compress the chest deeply enough despite recommendations. Data from large cardiac arrest registries suggest that rates above or below 100-120 per minute appear to reduce survival to discharge. The Thoracic Pump Model makes it clear why full chest recoil is important in generating cardiac output during arrest by maximising negative intra-thoracic pressure. It remains one of the most common errors in CPR and is particularly common during prolonged CPR due to rescuers tiring and tending to lean on the patient between compressions. Immediately following VF the heart continues to be filled by residual venous return but with no forward flow the chambers expand. This reduces the efficacy of electrical therapies. Watch the following time-lapse of 15 min of VF in 15 sec to see the effect in action. 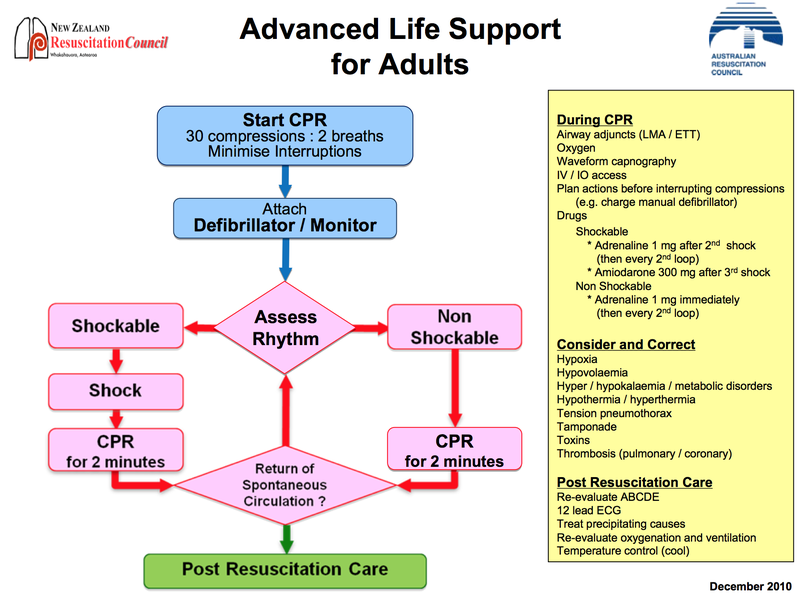 Just as we now charge the defibrillator during compressions to avoid interruptions in CCCs it is essential to restart CCCs immediately AFTER defibrillation without waiting for reassesment of ROSC. This sequence needs to be well drilled and the Team Leader must give clear direction to ensure this occurs. Signs of ROSC which might be useful in manual CPR can be more difficult in patients undergoing mechanical CPR. 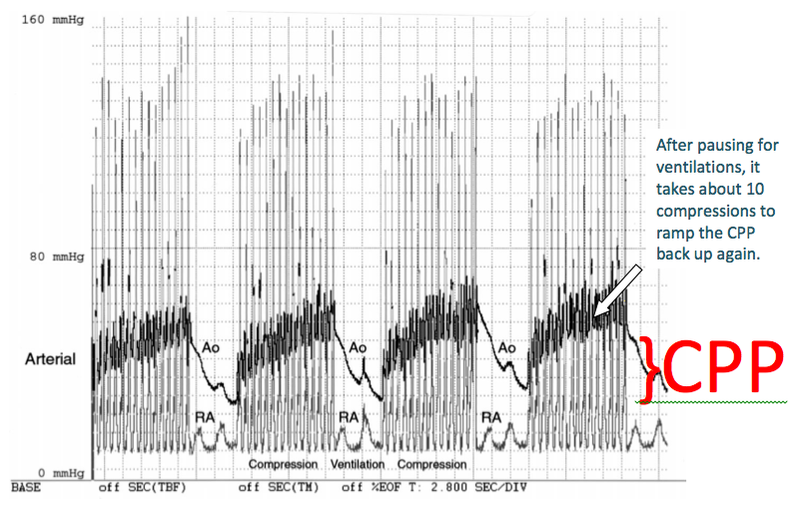 Traditionally a sharply rising ETCO2 or evidence of spontaneous movements will indicate ROSC but some patients may demonstrate these features whilst undergoing mechanical CPR without underlying cardiac activity. 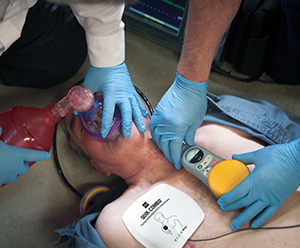 Sometimes sedation is even required during cardiac arrest for patients when mechanical CPR devices are used because improved cerebral perfusion can result in spontaneous movements. If you need to ventilate using a BVM the 2 person “Thenar Eminence Technique” (Thumbs-to-toes) is much more effective than single person or C-grip. Whilst the benefits of drug therapy for cardiac arrest remain controversial current guidelines (such as the ARC below) continue to advocate Adrenaline every second cycle and Amiodarone for refractory VF/VT. Again it remains secondary to performance of optimal CCC. Vascular access should be placed without interrupting CPR.